The National Assembly passed the Tax Revision Bill last week. The Bill is now with the National Council. The Council will discuss the Bill, but, because it is a “money bill”, the Council can only make suggestions and recommendations that the National Assembly may, or may not, chose to accept. The National Assembly has passed the Tax Revision Bill. But, we didn’t discuss it properly. After the Bill was introduced, the members made general comments. But the specifics of the Bill, including the individual taxes were not discussed, and just one item – Green Taxes on vehicles – was put to the vote. I’m happy that the National Assembly didn’t approve most of the taxation measures. In fact, in my humble opinion, even the reduced green tax should not have been approved, given that the government failed to make a strong enough argument justifying the tax. Still, we should have discussed the bill properly. The government should have justified each and every tax raise that they had proposed. And the Assembly should have debated the proposals thoroughly before deciding to approve or reject them. Justification to raise taxes. The Tax Revision Bill proposed introducing a Green Tax (for vehicles, fuels, lubricants, kerosene, LPG, refrigerators, freezers and air conditioners); raising the Excise Duty (on alcohol, domestic and imported); and raising the Sales Tax (on meat, fish and eggs, silk fabrics, furniture, and power chainsaws). The government informed the Assembly that the proposed taxes would help address the ongoing rupee shortage. But we didn’t get to discuss how, and by how much, the taxes would reduce imports from India, or enhance overall exports. I’m all for raising taxes. But only if the government can justify, with numbers, why the taxes need to be raised and how the increased revenue will be spent. The government would also have to prove that the increased taxes would not overburden the people, directly or indirectly, and that they would not make doing business any more difficult. In this case – if taxes are being raised to address the rupee shortage – I also wanted to know that the government would not spend the extra revenue generated. Spending that money would just add to the rupee problem, not solve it, as almost all of the government’s expenditure ultimately goes to finance imports of goods and services, mostly from India. The so-called “green tax” is a new tax. As such, the Parliament should have first discussed the need for this tax, and then amended the relevant laws to permit the government to impose this new tax. Then, and only then, either as part of an amended law or as part of the Tax Revision Bill, should the government have proposed to levy the tax. But I had several other questions on the Green Tax. One, why levy a green tax if the real objective is to reduce the rupee deficit? The purpose of a green tax should be to protect the environment, not to reduce the rupee deficit, and the proceeds from tax should go to programs that solve environmental problems. But, two, do we have major environmental problems, and, more importantly, would the proposed green tax result in positive and meaningful contributions to the environment? Three, wouldn’t taxing kerosene increase the cost of living for our poor? They are the ones who are the most dependent on kerosene for cooking and lighting. And wouldn’t taxing fuel increase the cost of transport, and therefore, the cost of goods? Would the general population be able to afford the resulting increase in the price of goods and services? And four, do we really want to tax refrigerators and air conditioners? Would the taxes result in a decrease in the number of refrigerators, and if so, would that make a meaningful contribution to the environment? On the other hand, shouldn’t we be encouraging our people to enjoy the immediate health benefits and the conveniences of refrigerators? Excise on alcohol. Alcohol is a real and growing menace in Bhutan. We need to act now, before we lose more people, especially our youth, to this scourge. But taxes alone will not prevent our people from drinking excessively. We need a holistic strategy, which includes taxes, but only as a part of bigger, more comprehensive action plan. If the government must tax alcohol, tax those products that are the most dangerous. Last year’s tax increase avoided them; ditto this year. Meat, fish and eggs. Taxing these items will, supposedly, lead to lower consumption, which, in turn, will lead to lower imports. Good. But what about domestic production? Wouldn’t the increased taxes also hinder domestic production of meat, fish and eggs? Furniture. Tax imported furniture. But please, please, don’t make domestic production any more difficult than it already is. Silk fabric. I have no idea how imposing a 10% sales tax and 50% customs duty on silk fabric will improve the rupee situation. But if it does, I’m for it. Otherwise, we need to rethink our strategy. Power chainsaw. What’s the big idea of slapping a 20% sales tax and 30% customs on power chainsaws? If it is the environment, strengthen and enforce existing regulations. But, please, let’s not arbitrarily increase the price of labour saving devices. The rupee crisis. The government must apply fiscal policy to address on-going and growing rupee shortage. One way is to increase taxes. But I’m not convinced that the proposed taxes would have had a meaningful effect, especially if the government were to spend the increased revenue from the increased taxes. A better and more effective way to control the rupee crisis would be to reign in government expenditure. But that’s not what’s been happening. The government’s current expenditure for 2010-11 was Nu 17, 735 million. It jumped to Nu 17, 185 million in 2011-12. And just last week, the Assembly approved a current budget of Nu 18,262 million for 2012-13. Coffee, many say, is the most popular beverage on earth after water. Yet good coffee is hard to come by in most places. 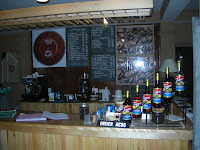 But it is available in Thimphu, at Karma’s Coffee, located in the Zhamling Building somewhere above Hotel Phuntsho Pelri. Karma’s is owned and run by Karma Tenzin, Bhutan’s first barista, who spent about two years in Australia training to make good coffee. And he made a lot of it: about four to five hundred cups a day! Back home the pace is much slower. He makes only 40 to 50 cups of coffee a day. This, he claims, allows him to pull the perfect shot of espresso each and every time, This also allows him to offer his customers a much wider choice of espresso-based drinks, from cappuccino to a range of lattes all brewed from the choicest Arabica beans. Karma’s is open everyday, from 11 AM to 9 PM, and serves milk shakes, freshly squeezed fruit juices, tea, iced coffee, cakes, sandwiches, and great coffee, all in a cozy setting offering comfortable seats, cool music, and free wifi, where no one will bother you as if you fiddle your laptop or bury your head in a book. Karma Tenzin is courageous. And he is a professional. I’m impressed. The Bhutan Chamber of Commerce and Industry has just concluded its 24th Annual General Meeting. The gathering attracted some much needed attention for the private sector in general and the BCCI in particular. The minister of economic affairs addressed the AGM during its opening ceremony on Thursday, and encouraged the private sector to come up with new business ideas. On Friday, our prime minister also attended the meeting. And he spoke at length – for more than two hours, some say – to the business community about what the private sector can expect from our government. He reiterated our government’s promise to make Bhutan a preferred destination for ICT businesses. Yes! It’s about time that we started harvesting the enormous business and employment potential of ICT. And he promised a one-stop service centre to make doing business easier. Yes! Our business community has heard this promise over and over again, first from previous governments and then, very compellingly, during the campaigning that preceded last year’s elections. And still no one-stop service centre. But now I’m very hopeful. Kuensel’s article on the AGM is available here. I’m humbled by the quality of the responses to my last entry – they are insightful, meaningful and educative. And every one of them shows deep concern over how difficult it is to do business in our country. But your responses scared me. I suddenly realized that Doing Business ranking for Bhutan may be terribly inaccurate. Why? Because Doing Business measures regulations and procedures that affect business activity, regardless of how well or poorly the regulations are applied. Your responses all say the same things in various ways: that regulations are not our biggest constraint to doing business; that that distinction goes to our officials, the enforcers of the regulations; that doing business is really difficult because officials do not do their job properly, or are simply absent from work; and that unless one has proper connections it is very difficult to get down to business. Yes, our regulations and procedures are not business friendly…that’s why Bhutan is ranked 124th in the world. But what Doing Business does not measure is the attitudes of officials. If attitudes are factored in, expect our already poor ranking to plummet all the way to the bottom. So yes, let’s review and improve business regulations. Let’s keep those that enhance business activity. And discard those that constrain it. But, more importantly, let’s improve the way our officials conduct their business. Let’s change the mindset in officialdom: from enforcer to service provider; from the person in charge to the person serving; from commander to servant. Last year, both parties convincingly articulated their promises to change the mindset of the government and the civil service. It’s time to walk that talk. Everywhere I look I see people, thousands of them, buying and selling goods and services. It must be easy to do business in Thailand. In fact it is: Doing Business 2009 ranks Thailand 13th out of the 181 economies that the World Bank studied. Doing Business investigates government regulations that affect the following 10 aspects of business activity: starting a business, dealing with construction permits, employing workers, registering property, getting credit, protecting investors, paying taxes, trading across borders, enforcing contracts and closing a business. Bhutan, as we know very well, is ranked 124 (read Doing business isn’t easy anywhere). Here’s how we fared in each of the 10 dimensions covered in Doing Business 2009. So what do these rankings mean? How did we get there? Why? What can be done? I’ll post a few entries on some of these areas to initiate public debate going. Let’s get down to business. Let’s make doing business easier. Let’s strengthen our private sector. But it’s getting even harder in Bhutan! In “Really hard business” (read blog entry) I had grumbled that doing business in our country was really hard – the World Bank had ranked Bhutan 119th of the 178 countries it had evaluated on ease of doing business in 2008. Guess what? Doing business in Bhutan has become even harder! Doing Business 2009 report now ranks Bhutan 124th out of 181 countries that were investigated (see ranking). And in South Asia, Bhutan, ranked 7 of 8, fares better than only one country, war torn Afghanistan (see ranking). So what, you may say, our economy has grown rapidly. True, we have enjoyed unprecedented growth – the size of our economy has more or less doubled every 5 years since 1980, and per capita GDP, at US$ 1900, is the highest in our region. That our economy has grown fast is good news indeed. But the far more important question to ask is: how did it grow fast? Our economic growth has been fueled by loans, foreign aid and hydropower; not by productivity; and not by the private sector. The private sector has not been able to drive economic growth because it is weak. And it is weak because it so hard to do business in Bhutan. Meanwhile, our vision of strengthening the private sector and making it the “engine” of growth remains just that – a distant vision. And, in spite of the impressive numbers, our economy is actually very weak, which manifests quite clearly in rising inequalities, youth unemployment and widespread poverty. So what should we do? 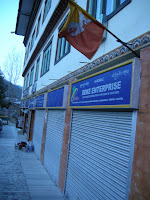 Make it easier to do business in Bhutan. Make it easier for our people to realize their full entrepreneurial potential. Make it easier for businessmen and women to contribute to the economy. Review rules and regulations. And make them business friendly. Only then can we expect Doing Business to declare better results for Bhutan. That said, Doing Business report is, at best, only a test that provides indicators to the state of our domestic business environment. But we should take these indicators seriously. After all, potential investors all over the world take them very seriously. We may have lost the elections. But I still read our manifesto every now and then. It reminds me of our promises. Reminds me to serve with humility. And to walk the talk. The following article is a “box” from our manifesto. Enjoy. But, it’s really hard in Bhutan! Doing Business 2008, the fifth annual report on this investigation, ranks 178 countries on the ease of doing business. Singapore is at the top, followed by New Zealand, USA, and other industrialized countries. No surprise. Democratic Republic of Congo is at the bottom, along with a number of other African countries. No surprise there, either. Bhutan is ranked the 119th out of 178. You might say “no surprise!” But, we do worse than some African countries (Zambia, Uganda), parts of the world badly affected by war and internal conflicts (Pakistan, West Bank and Gaza, Sri Lanka), and distinctly worse than Bangladesh and Nepal. Surprised? We should be. It is really hard doing business in our country, especially if you are small or self-employed. No wonder the private sector is not flourishing. No wonder the young people are having a hard time finding jobs. Bhutan is particularly weak in areas such as trading across borders where we are ranked 149th compared to India (79th) and Bangladesh (112th); and in access to credit where we are 158th compared to India (36th), Bangladesh (48th) and Nepal (97th). These statistics beg the questions: why is government standing in the way of Bhutanese doing honest business, generating income and creating jobs? And how can we expect the private sector be the “engine of growth” in such a hostile environment? Doing Business 2008 including its country results is available to anyone at http://www.doingbusiness.org/. Reportedly, it is taken seriously by investors looking for business-friendly countries.